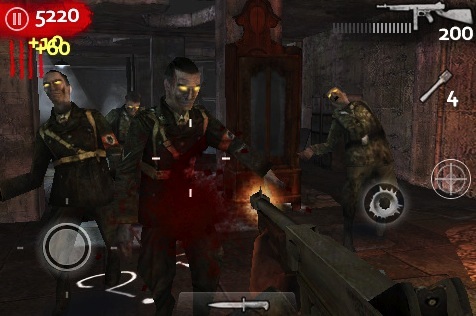 Nazis rise from the dead in this stellar first person shooter. Say what you will about the single player campaign, but Call of Duty: World at War's Nazi Zombie mode was without question the game's primary selling point. Banding together with three players to outlast waves of progressively tougher monsters made for a great evening, and now you can experience the brain splattering fun on the go with Activision's Call of Duty: World at War: Zombies for the iPhone. This is essentially the same exact first person mode (including the same map, Nacht der Untoten) from the PC, PS3 and Xbox 360 versions. In it, you must defend the building from small gangs of flesh-eating creatures by any means necessary. They slowly pour in through the windows, so you need to not only repair the barricades (achieved by walking up to a window and tapping an onscreen button) but also blast the zombies to bits using an impressive array of authentic World War II weapons, such as the flamethrower and M1 Carbine (you can also press the knife icon and jab the buggers' eyes). You receive cash for each kill, which you can use to fix those barricades and acquire new guns. There's also a set of unique achievements to earn and various difficulty levels, in case you really crave a challenge. Despite the obvious loss in detail, World at War: Zombies is incredibly enjoyable and a wonderful way to pass the time. The zombies move beautifully, shambling around and losing limbs (or their heads) when shot. The weapons sound authentic, the other effects are equally impressive and Activision offers three different control types: Touch screen (where you move with an on screen analog stick and aim by sliding a finger around the screen), Dual Stick (similar to how you'd play on consoles, easily the best option) and Tilt (you physically move the iPhone to aim). You'll definitely find a control type that suits you. The game's best feature, of course, is multiplayer. There's support for four people via Wi-Fi/Internet (two person Bluetooth coming soon) and the action runs smoothly, even as multiple zombies clog the screen. You'll have to set up a profile to play, but that only takes a couple of minutes. It also helps that Activision finally released another map. Verruckt takes place in a large two story zombie asylum, complete with a little shock therapy for the undead. We prefer to unlock the upstairs and just camp in a corner, picking off the marauding creatures with a trench gun and (when things get crazy) jabbing them with the combat knife. Naturally, this is a lot easier with three other players, but we were able to make it to the seventh wave on our first try. On top of that, you'll receive nine new weapons (like the FG-42, Gewehr-43 and the M1 Garand), 13 new achievements for the original map, plus nine for Verruckt and leaderboard tweaks that track kills, headshots and other cool stuff. The only downside? It'll cost you $4.99 to purchase this new map. While not horrible by any means, this is one of the few iPhone games that charges users for additional content. 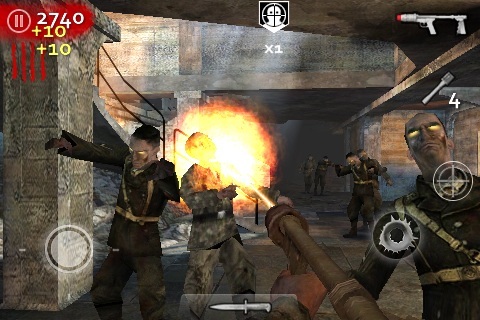 Overall, Call of Duty: World at War: Nazi Zombies is an attractive and immensely entertaining app that is hopefully a small taste of what'll come from Activision in the future. Don't hesitate to download this bloody action game. The asking price is a bit steep ($14.99 to download it and Verruckt), but you'll definitely get your monies worth, especially if you battle alongside other iPhone users. What's Hot: Faithful recreation of the console hit, three unique control types, nice assortment of WWII weapons, outstanding four-person multiplayer via Wi-Fi, gooey headshots. What's Not: Costs $9.99, additional maps cost $4.99.